There is something about this time of year, that I just love to cuddle up and sit down and watch a great movie with my family. 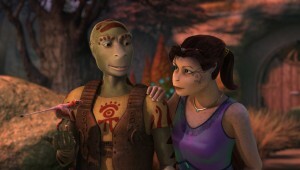 Here is a never before seen image from the movie. As you can see the movie is animated which would make a great hit for the whole family. From watching a short trailer of the movie, I can tell the movie will keep you on your toes. It is very fast paced, and full of action and adventure. I really like the morals in the story as well. For example, in one part of the movie, two people have to put their differences aside in order to combine together to take an enemy down. I will not say anymore than that, as I do not want to spoil it. You will hear some very familiar voices in the movie such as, Freddie Prinze Jr., Jennifer Love Hewitt, Burt Reynolds and Kelly Ripa to just name a few. Overall, I think this is a great movie to go out and watch with your family. It’s fun, it will keep your attention, and the animation is such great detail in the movie. To learn more read here: Delgo It will be released in theaters on December 12… so let me know if you all plan on going to see it! It’s been a big change over the last few years, but my family goes greener a bit by bit each day. Our goal is to be pretty much an all green family sometime in the near future including a Solar Panel House. Going green really means a lot to myself and so happy to have my hubbs on board with me. Even our girls stop and think before doing things now. I know there are so much more we can do though to go more green. A few months ago I started using the Clorox Green Cleaner. Yea I pretty much heart that stuff SOOOOO MUCH. You have to know I was so thrilled to hear they were coming out with a site of 30 Days to Natural. It includes daily tips for 30 days to help your family go green. I am so stoked to start receiving my tips and sharing them with my family. I truely encourage you to sign up and do the same for your family. You do know, what we do now to go more green, is going to help our children and grandchildren when they get older. :). :::CHEERS:::: (us clanging our glasses) to a better world. We can all change it one person at a time! 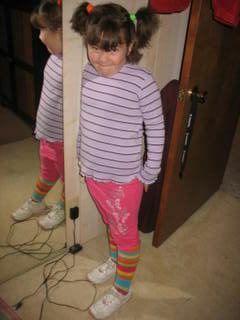 This week at M’s school they are having Spirit week. I always loved this as a child. 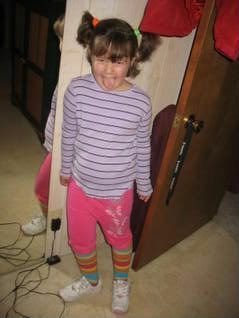 Well today was Tacky Day AKA (let your kid dress themselves day). M picked out her outfit and I just started laughing. I told her it had to be crazy and I think she did a pretty darn good job of it… don’t ya think? I just love her… She melts my heart over and over. 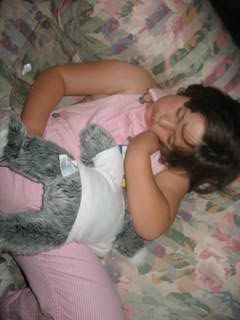 Also while I have your attention… M was sent a special Koala bear last week from Build a Bear. She just loved it from the minute she got it out of the box that evening. I didn’t realize they have bears now for as low as 10.00. How cool is that? Also once you make your bear, you can go online and have a virtual pet at Build a Bearville. I was really impressed with the quality and as you can see below… it fit perfect in M’s lap so she could snuggle with and have an after school nap. We would like to share with you and let your kid have their own very special bear. I have two 10.00 gift cards I would love to give to two lucky parents to give to their children. Leave a message below and I will draw two random entries on Friday October 31, 2008. Good Luck! The first product was the Aquadoodle Draw ‘N Doodle. My girls love to draw. Thank goodness we are past the stage where they loved drawing on the walls. PHEW! 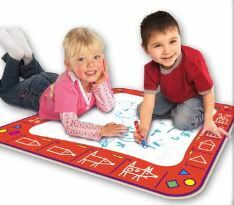 We pulled this out one evening, and the girls had a blast drawing all the little drawings that are featured in the red part of the mat. All we had to do is fill the pen that comes with the mat with water. They girls could draw to their little heart was content and I didn’t have to worry there would be a big mess with crayons or markers all over the floor. Also, the pen only works with the mat so you are safe from your child trying to color on all the furniture and walls ;). The pen is reusable, so you can have fun with this mat for a very long time. Once the girls filled up the whole mat, all we had to do is lay it in a flat spot to dry. Once the mat dries, all the drawings disappear and you are able to draw more. My girls definitely give this a thumbs up. I do have to say it is a blessing for rainy days as well! 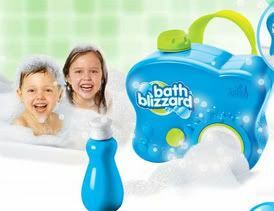 The second product was the Bath Blizzard. This has been soooo much fun. My girls have always loved bubble baths, but I usually just make our own bubbles each night during their baths. When I first seen this on TV, I was not sure what to expect. I was glad we were given the opportunity to try it. It hangs securely on the side of your bathtub and all you need to do is turn the knob. Here comes the flow of bubbles and you get to hear the screams of delight from your children. My girls totally just lit up with smiles when they seen the bubbles start coming out. They both love bath-time, but I think this has totally made bath-time super cool now. It takes me a bit to get them out of the bath now ha ;). I do like that you can use any bubbles in the machine, so we can use our own safe blend of bubble mixture. It is really durable and made well. I feel that it will last us a long time even with the girls pounding on it. We definitely give this two thumbs up! Does your kids love to build? Well my girls have seen their cousin’s K’Nex set and always wanted to join in, but I was so scared because of all the little pieces. Great news for us K’Nex has come out with building sets that will cater to the 2 to 5 year old age. We were sent this Oscar Building set for the girls to try out and…. I couldn’t get it opened fast enough for my 3 year old. She spent I know a good hour and half putting this together, taking it apart and putting it back together. She even got hubbs in on the action. It was cute seeing them together on the living room floor playing. Of course when my 5 year old came in from school, she wanted in on the action. You do not have to worry about them getting bored with it as they can build the sesame street character their own unique way. Also the parts are just the right size for this age group so you don’t have to worry about them getting choked. One of the best parts I really like, is the building sets come with their own canister. So all you have to do is have your child take the parts apart and put them away simply in the canister. Also… they are really priced low at 10.99. Perfect price for a birthday gift, christmas gift, or just a reward for good behavior. My girls and I… oh yea hubbs too definitely give this set two thumbs up!